The mass spec of chlorocyclohexane shows a peak at m/z = 83. Use curved arrows to show the heterolytic cleavage that accounts for this fragment. Heteroatoms (atoms that are not C or H) are always the most likely atoms to lose an electron during mass spec, and this will be no exception. Mass spec will blow off an electron from the chlorine, leaving behind the molecular ion (M+). But the molecular ion will then fragment. The problem told us it was a heterolytic cleavage, in which both electrons form the bond go towards the positive charge. Because two electrons are involved, we use curved arrows as usual. This results in a neutral chlorine radical and a carbocation with formula C6H11, for a total mass of 83 (6 x 12 + 11 x 1). 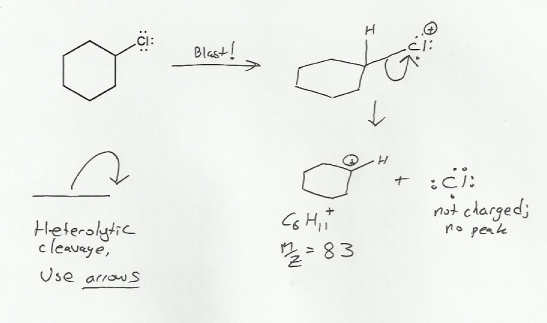 Note that the chlorine radical doesn't give an MS peak because it is neutral. MendelSet practice problem # 657 submitted by Matt on July 17, 2011.